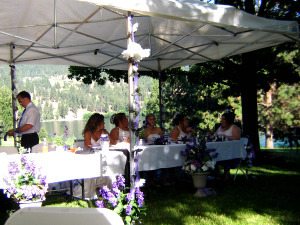 Outdoor wedding reception food for a park wedding takes a lot of planning but can be done with right choice of food. Bride to freshen up? Is there shade for the guest tables? Is there an out of the way shaded area for a kid's table? 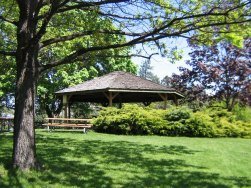 Even if the weather is great and you've got lots of shade, there should always be a few tents available, because weather is unpredictable. For our outdoor wedding we ordered tents from a party supplies rental company that specializes in out door reception venues. They delivered the tents and picked them up later. We just called the rental company a few weeks ahead to reserve the tents. We sent them a deposit and gave them the date, place and time for delivery. Some companies will assemble and disassemble the tents but I think we had arranged to that ourselves. One very important thing is drinking water, or other beverages. We purchased several cases of bottled water from the department store and just about ran out. We didn’t consider the set up crew. We had volunteers from a non profit organization that did volunteering has part of their training. Setting up a wedding in a park can be very hot, sweaty work, but in the end it's all worth the effort. Do you have a Wedding story to tell? We'd love to hear it. Just click on the link below.